"My name is Jeff, I spoke to you a couple of times about my dog Axel. I just recently spoke to you on the phone to let you know how good I think vg750 has worked. Here is a video of him 6 weeks post operation, I have taken him off rimadyl and no pain killers just vg750. One week ago he would not put any weight down on his left leg, look at him now! " It is crucial to address potential joint deterioration before chronic stresses impact the joint conformation and structure. There are several factors which may lead to the deterioration of joint health. The fact is there is no cure for degenerative joints, management is the key. Start now and GET ON TRACK, boost your dogs natural ability to heal while promoting strong tendons and ligaments with VG750. 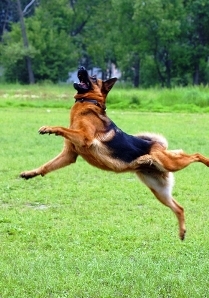 VG750 is beneficial for any dog whether they are a companion, working or competitive. VG750 is great for dogs of any age it’s never to late to start them on a daily maintenance regiment. Discover the holistic benefits of VG750™. #1 Customer Recommended Holistic Joint & Mobility Supplement For Active and Aging Dogs! Now you have the ability to maintain and restore the mobility in your best friend and join the hundreds of satisfied customers that have discovered the natural benefits of NUTRA-9 LLC's™ VG750™. Our customers have witnessed the progress in their dog’s and now trust VG750™ to deliver fast, safe and powerful results to help maintain an active and enjoyable life for their dog. Don’t allow your best friend to suffer for one more day, free them from the lack of mobility and discomfort caused by joint ailments. Experience the difference that only VG750's™ natural supplement can provide. It is of the utmost importance to follow these basic guidelines in addition to VG750 it is important to provide a K-9 with a quality dog food, a daily exercise regiment based upon the K-9s physical condition and a quality dog bed. Following the prescribed steps will promote healthier joints and enhance overall mobility. The first year VG750 is not recommended for puppies less than a year old. (It is important to allow growth platelets to develop and mature undisturbed during the first year of a puppy’s life) Only in the event of a joint injury and under the recommendation of a veterinarian VG750 may be administered. For any companion, working or competitive K-9 one year or older a daily regiment of VG750 is recommended to aid in the natural healing process while promoting strong muscle, tendons and ligaments. For all senior K-9s VG750 is recommended to enhance the natural healing process and aid in the restoration and mobility of the joints. 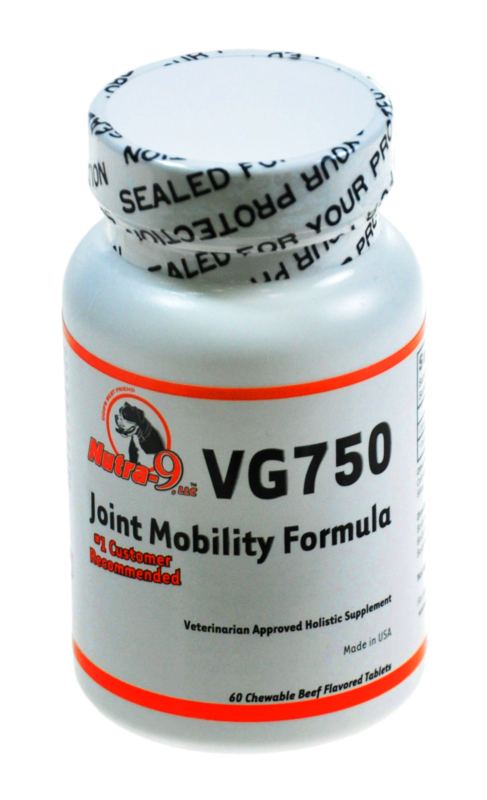 VG750 delivers analgesic and anti-inflammatory properties which will aid in comforting K-9s suffering from the pains of degenerative joints. VG750 is not eligible for reward points. I started my 5 1/2 year old Dane on VG750 2 months ago as a preventative to what I thought was going to be inevitable mobility problems associated with aging. What I didn't realize is what a difference it was going to make in his life right NOW! He has resumed his daily "zoomies" around the backyard & acts like a BIG goofy puppy again. Thanks Dan for suggesting NOW was the time to start him on this stuff! About 2 months ago(10/03/08)- I was on a bulldog website and saw information on Nutra- 9 and the VG750 product so I decided to try it. I received it about 2 weeks ago and began giving it to Maisy. BOY WHAT A CHANGE!! She is running and playing again. I can’t thank you enough Dan for this product. I felt so helpless at times because I couldn’t help ease Maisy’s pain and now, by the photo, you can tell she is feeling good! I want to thank you for this product. Within three days of taking my 13 year old dog off Rimadyl and putting her on VG750, she had more energy, she lost her "vertigo" symptoms, and she hasn't missed once jumping onto my (very high) bed. I have told every dog owner I know about this. It is great!!!! I am seeing an improvement in my lab, Boomer, since I started him on VG750 on Nov. 24. He is back jumping on couch for his usual nap time. 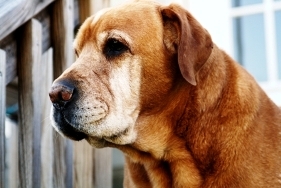 I have also started giving it to my other dog who is 15 and developing arthritis in his hind legs. I hope by the end of the second bottle to see an improvement in him, also. Thanks for helping all of us who love our wonderful little friends and want to make their senior years as enjoyable as possible. hello... I know you must have met a lot of people at the pet expo.. so just a recap. I talked with you for a while had the black lab who was 11 years old who does pet therapy.... I bought a bottle of your pills and have been giving them to Sophie for 2 weeks now and i just wanted to tell you i think they are doing great. she actually did a little jog at the beach the other day... and she got up on my bed without my help the other night... I have to tell you I am very glad I stopped to talked to you... if I can do anything to help get the word out please let me know..